You can configure VPC peering connections so that your route tables have access to the entire CIDR block of the peer VPC. For more information about scenarios in which you might need a specific VPC peering connection configuration, see VPC Peering Scenarios. For more information about creating and working with VPC peering connections in the Amazon VPC console, see Working with VPC Peering Connections. 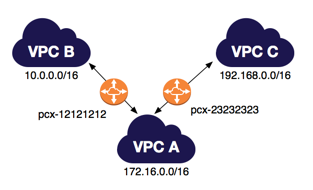 You have a VPC peering connection (pcx-11112222) between VPC A and VPC B, which are in the same AWS account, and do not have overlapping CIDR blocks. You may want to use this kind of configuration when you have two VPCs that require access to each others' resources. For example, you set up VPC A for your accounting records, and VPC B for your financial records, and now you want each VPC to be able to access each others' resources without restriction. The route tables for each VPC point to the relevant VPC peering connection to access the entire CIDR block of the peer VPC. For more information about updating your route tables, see Updating Your Route Tables for a VPC Peering Connection. You have the same two VPCs in the VPC peering configuration as above. In this example, VPC A and VPC B both have associated IPv6 CIDR blocks. The route tables for each VPC point to the VPC peering connection to access the entire IPv6 CIDR block of the peer VPC. For more information about IPv6 in your VPC, see Your VPC and Subnets in the Amazon VPC User Guide. You can add IPv4 CIDR blocks to your VPC. In this example, VPC A and VPC B have multiple IPv4 CIDR blocks. The route tables for each VPC point to the VPC peering connection to access all the IPv4 CIDR blocks of the peer VPC. For more information, see Adding IPv4 CIDR Blocks to a VPC in the Amazon VPC User Guide. You have a central VPC (VPC A), and you have a VPC peering connection between VPC A and VPC B (pcx-12121212), and between VPC A and VPC C (pcx-23232323). The VPCs are in the same AWS account, and do not have overlapping CIDR blocks. You may want to use this 'flying V' configuration when you have resources on a central VPC, such as a repository of services, that other VPCs need to access. The other VPCs do not need access to each others' resources; they only need access to resources on the central VPC. VPC B and VPC C cannot send traffic directly to each other through VPC A. VPC peering does not support transitive peering relationships, nor edge to edge routing. 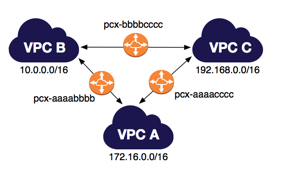 You must create a VPC peering connection between VPC B and VPC C in order to route traffic directly between them. For more information, see Three VPCs Peered Together. 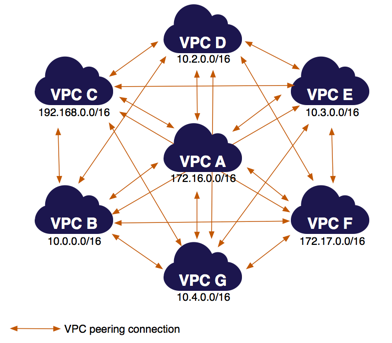 For more information about unsupported peering scenarios, see Unsupported VPC Peering Configurations. You have the same three VPCs in the VPC peering configuration as above. In this example, all three VPCs have associated IPv6 CIDR blocks. You may want to use this full mesh configuration when you have separate VPCs that need to share resources with each other without restriction; for example, as a file sharing system. 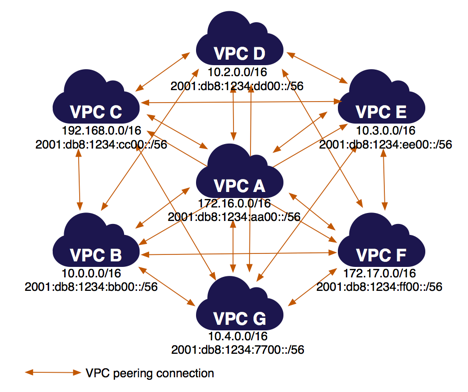 The route tables for each VPC point to the relevant VPC peering connection to access the entire CIDR block of the peer VPCs. You have the same three VPCs in the VPC peering configuration as above. In this example, VPC A and VPC B both have associated IPv6 CIDR blocks. VPC C does not have an associated IPv6 CIDR block. 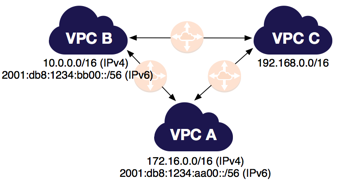 The route tables for VPC A and VPC B include routes that point to VPC peering connection pcx-aaaabbbb to access the entire IPv6 CIDR block of the peer VPC. 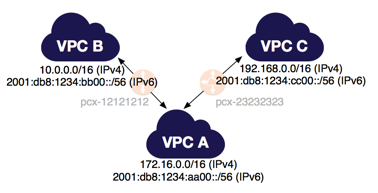 VPC A and VPC B can communicate using IPv6 over the VPC peering connection. VPC C cannot communicate using IPv6 with either VPC A or VPC B.
VPC A is peered with all other VPCs, but the other VPCs are not peered to each other. The VPCs are in the same AWS account and do not have overlapping CIDR blocks. None of the other VPCs can send traffic directly to each other through VPC A. VPC peering does not support transitive peering relationships, nor edge to edge routing. 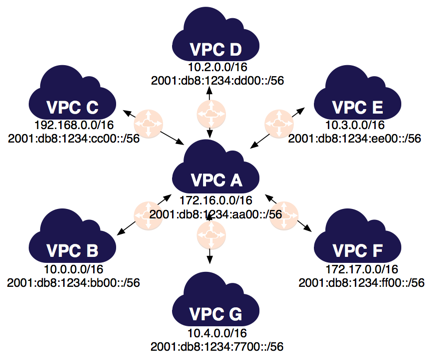 You must create a VPC peering connection between the other VPCs in order to route traffic between them. For more information, see Multiple VPCs Peered Together. 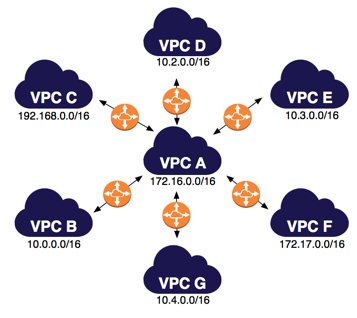 For more information about unsupported peering scenarios, see Unsupported VPC Peering Configurations. You may want to use this spoke configuration when you have resources on a central VPC, such as a repository of services, that other VPCs need to access. The other VPCs do not need access to each others' resources; they only need access to resources on the central VPC. You have the same VPCs in the VPC peering configuration as above. All VPCs have associated IPv6 CIDR blocks. The route tables for each VPC point to the relevant VPC peering connection to access the entire IPv6 CIDR block of the peer VPC. The VPCs are in the same AWS account and do not have overlapping CIDR blocks. You may want to use this full mesh configuration when you have multiple VPCs that must be able to access each others' resources without restriction; for example, as a file sharing network. For more information about updating route tables, see Updating Your Route Tables for a VPC Peering Connection.